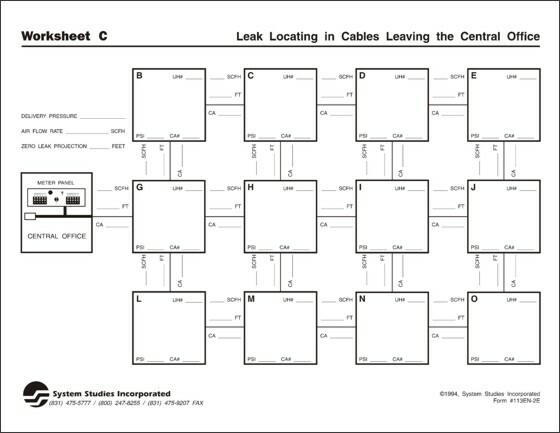 Cables leaving the central office can be systematically checked for leaks by following the procedures outlined by Worksheet C. When PressureMAP's Dispatch Priorities indicates that the distribution panel in the central office needs routine maintenance, this worksheet will help to simplify the process. Worksheet C outlines a step-by-step leak locating procedure and provides a record keeping area. Side one is designed essentially the same as Worksheets B, D and E. There is a logical layout of utility holes (indicated by alphabetized boxes) and a specially designated box which represents the office distribution panel.